Tribes Overall: "The mix of Botswana and South Africa made the trip all the more special. Both places provided fantastic and experiences and wonderful memories. " Tribes Service: "Tracy our consultant was very knowledgeable and made great suggestions. We were lucky enough to meet her at a travel show earlier in the year and her obvious knowledge of and love of both Botswana and South Africa made us feel that we would be making a good choice in choosing Tribes for our holiday. We thoroughly enjoyed staying at all the places chosen by her." Guides: ""Captain" Ninja at Chobe, "Professor" Ken at Kwai, KB at Oddballs, Joseph and Happiness at Cathedral Peak and Simon at Threetree were all excellent guides, very knowledgeable, friendly and keen to make sure that we had very safe but exciting experiences that met or exceeded our expectations"
Social & Environmental Responsibility: "We felt that the staff at all the places we stayed at really appreciated our visit as tourism is vital not only for their livelihoods but also provides employment for members of the local community too. Tourism is often the main source of employment in the area and the more visitors that come helps ensure that the camps remain sustainable . Ecotourism - maintaining a clean green environment is very much part of the ethos at all of the places that we stayed at." The wildlife on the game drives was excellent. The mokoro trip down the river provided an exciting encounter with a hippo! The hippo won and we got out and walked! We were able to experience a walking safari for the first time too. Once again the welcoming staff, great food and also chatting with other guests in the evening before and after diner really added to the experience. Set in beautiful surroundings. Many guests were repeat visitors. A full daily programme of activities was available should you wish to participate. We enjoyed a variety of walks including the really interesting one to see the bush art. We also joined in the crazy golf competition and the evening music quiz. Both great fun. Once again, a chance to chat to other guests in the bar and at meal times about their holiday experiences. A wonderful final stay at the end of our holiday. A beautiful location, in a truly historic setting. The game reserve walking safari offered a really memorable sighting of rhino. The trip to Spionkop enhanced our understanding of the Anglo Boer wars - Simon is a very enthusiastic and knowledgeable guide. The guest house staff worked hard to provide wonderful food and a really enjoyable stay. Conversations with other guests at meal times and round the fire in the evening again added to the overall interesting experience. To top it all, the night sky provided a beautiful viewing of the "blood moon" and the milky way on the last night of our stay. The site overlooking the river was beautiful. The food was always very good. Chatting with other guests around the camp fire in the evening provided great insights for future holidays. The camp staff were very friendly and welcoming and on one evening put on a special display of singing and dancing to entertain the guests. "The wildlife, the scenery and the people. 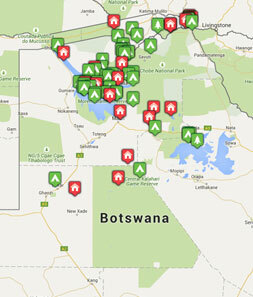 Botswana provided an abundance of wildlife - both animals and birds. The delta was really beautiful. South Africa - the Drakensburg mountains and the surrounding area enjoyed a perfect climate during our stay - not too hot so we were able to enjoy a variety of guided walks. Threetrees and the Spioenkop game reserve provided the only one of the big 5 that we had not seen in Botswana - the rhino. Simon's knowledge of the Anglo Boer wars and our visit to Spioenkop battlefield site also provided a truly memorable end to our holiday."